Nissan Kicks 2019: The new Nissan Kicks line-up in India will have four variants and 12 colour options across the range. Nissan Kicks 2019: The India-spec Nissan Kicks is larger in dimensions than the global model. The Nissan Kicks will be offered in four variants. There will be 12 colour options available across variants. Both the petrol and diesel engine will be a 1.5-litre motor. It's just days left to the launch of the all-new Nissan Kicks 2019 and the brochure of the upcoming compact SUV has surfaced online. The new Kicks will be launched with four variants- XL, XV, XV Pre and the top-spec XV Pre (O) both in the petrol and diesel range. While the top-end XV Pre (O) is sure to get the most bells and whistles, even the base XL trim in this new one is pretty well packed. It gets features such as LED daytime running lights, height adjust for the driver's seat, power windows, power-adjustable wing mirrors with integrated turn indicators, automatic climate control, rear AC vents and Bluetooth connectivity for the audio system which is linked to four speakers for the audio output. The top-end XV (O) variant of the Kicks is equipped with features like an 8.0-inch touchscreen infotainment screen which supports Apple CarPlay and Android Auto, 360-degree camera view which is a segment first feature and a big aid to nip through tight spots or while parking. 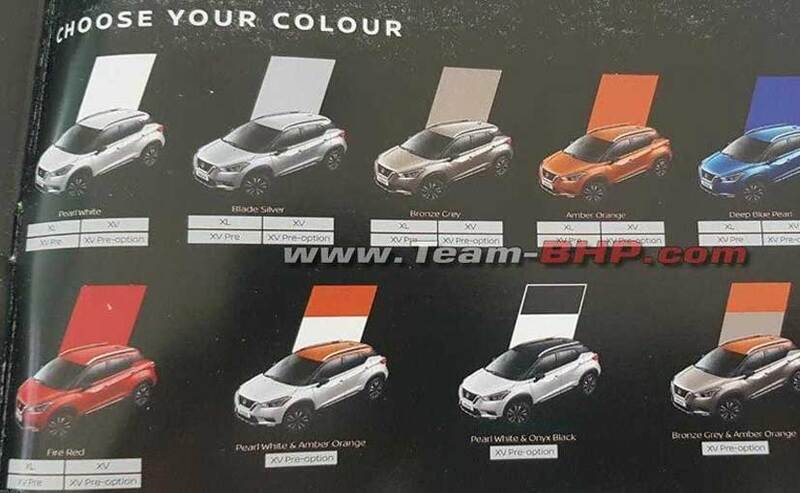 Nissan is offering the Kicks with a total of 12 colour options- Pearl White, Blade Silver, Bronze Grey, Amber Orange, Deep Blue Pearl, Night Shade and Fire Red while the top end variant also get dual-tone finish as optional such as white with orange roof, white with black roof, grey with orange roof and red with black roof. 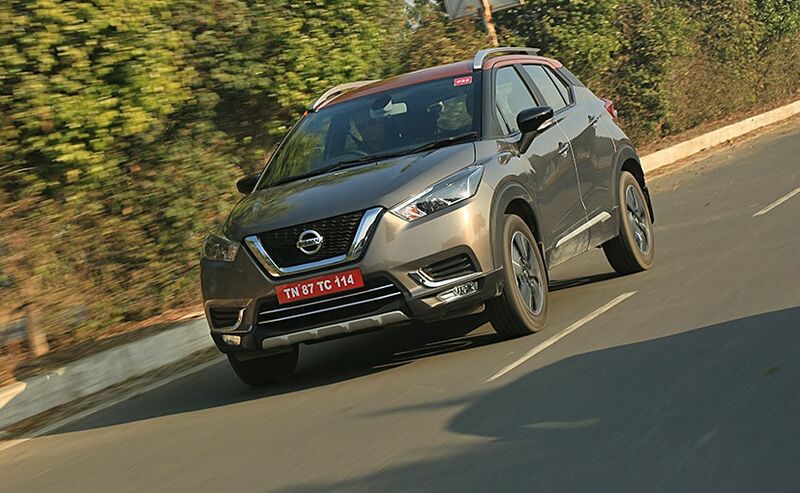 The India-spec Nissan Kicks is larger in dimensions than the outgoing model and is underpinned by the MO platform which is also shared by the Renault Captur, Renault Duster and Nissan Terrano. There will be a 1.5-litre diesel engine in the new Kicks which will produce 108 bhp and 248 Nm of peak torque and will be mated to a six-speed manual gearbox. While there will be no automatic at the start, Nissan is considering introducing it at a later date. The petrol Nissan Kicks will also get a 1.5-litre petrol engine which will produce 104 bhp and 145 Nm of peak torque and will be mated to a five-speed manual gearbox as standard. We have seen both the engines already doing duty under the hood of several Nissan and Renault models in India like the Duster, Terrano, Captur and even the Lodgy.